TABUK CITY, Kalinga, Jan. 3(PIA)-- The Armed Forces of the Philippines (AFP) reported it had decimated the strength of the New Peoples’ Army (NPA) operating in the province and does not consider them anymore a potent threat against internal security. Major Edward Viteno, Operations Officer of the 501st Infantry Brigade said the NPA strength of 42 in 2010 went down to 35 last year. However, he said the NPA firearms inventory decrease only to insignificant level from 57 to 54 compared to same period last year. He said the decrease in enemy number is a result of the government’s program of rewarding rebel returnees who surrender with firearms, educational assistance and livelihood. “Others were also lured to join the mainstream society because of developmental projects they have seen in rebel-infested barangays,” Viteno added. In 2011, he said six encounters between government troopers occurred mostly in Poswoy and Dao-angan in Balbalan and Tanglag in Lubuagan resulting to the death of four military personnel and the loss of several military hardware. He said most of the violent incidents happened in the first and fourth quarter of the year in celebration of the Communist Party of the Philippines and NPA founding anniversaries. The Provincial Peace and Order Council and the Kapehan body composed of heads of agencies proposed to revive the military detachments in Poswoy and Dao-angan. On the prodding of Congressman Manuel Agyao to locate detachments where they are really on guard against security threats, the Kapehan members in a meeting at Capitol on January 2 urged the Brigade Command particularly the 77th IB to transfer the Ileb detachment to strategic places. Meanwhile, Agyao appealed for everyone to support the fight against criminality in the province even as he pushed for the hiring of additional Philippine Drug Enforcement Agency agents for Kalinga . 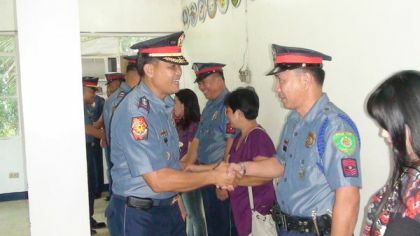 “But I also urge everyone to support our efforts since the fight against criminality is everybody’s concern,” he said.